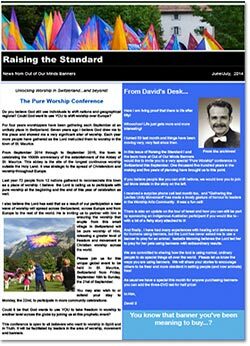 Newsletters - "Raising The Standard"
Welcome to our monthly newsletter "Raising The Standard". The purpose of the newsletter is to link people across the world that MOVE in worship, keeping them informed with the latest news. Each month the newsletter is crammed full with your stories, our stories, encouraging snippets, answers to common questions, Bible verses, and developments in flag and banner technology. From time to time we also provide discounts and updates of travel itineraries of Out of Our Minds Banners personnel. to our monthly one-page newsletter.